A UNIQUE beekeeping centre has been given the official go-ahead this week after securing £200,000 of funding. The groundbreaking National Beekeeping Centre for Wales (NBCW) will help preserve and enhance local and national beekeeping, and aims to help arrest a potentially disastrous decline in honeybee numbers. Once open, the innovative scheme will combine visitor facilities including a “hands-on” apiary with training courses and support for practical beekeeping research, so becoming the only project of its kind in Wales. The main centre aims to attract up to 25,000 visitors a year and will form part of the new £6.5m Bodnant Food Centre at Furnace Farm in the Conwy Valley. 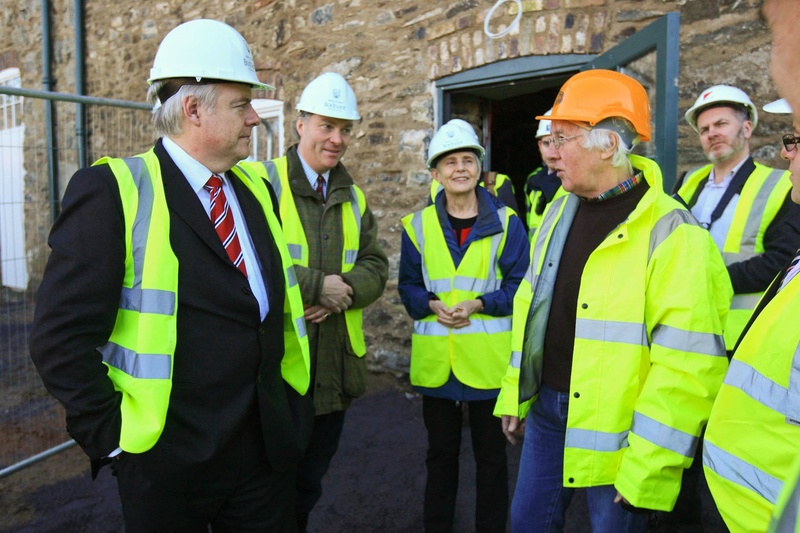 First Minister Carwyn Jones dropped into the centre on Friday to hear more about the project and see progress being made. NBCW will seek to develop practical research projects with beekeepers and academic researchers within Wales. The Centre will also develop its range of training courses at the Henfaes Research Farm, a Bangor University facility at Abergwyngregyn. A further visitor facility is being developed in conjunction with the Snowdonia Society at Tŷ Hyll near Capel Curig and will include queen bee mating hives and woodland gardens to provide examples of the ideal bee habitat. Bee-related produce, including honey and wax products, will retail from the Tŷ Hyll and Bodnant sites. Funding for NBCW has mainly come through the Conwy Rural Partnership under the Axis3 Environment theme of the Rural Development Plan for Wales. Other funders include Environment Wales, Snowdonia National Park CAE Fund, South Clwyd Beekeeper’s Association and the Welsh Beekeepers’ Association – John Hall legacy. Conwy Beekeepers’ Association is another financial contributor, and has played a key role in bringing the ambitious project to the county. The 150-member strong Association successfully relaunched the 700-year-old Conwy Honey and Seed Royal Charter fairs in the 1990s. This strong relationship between Conwy and the beekeeping fraternity meant that the Furnace Farm development was the ideal location for Wales’s national centre. The visitor centre is planned to open at the same time as the Bodnant Welsh Food Centre. As well as two members of staff, NBCW aims to recruit 20 volunteers in 2012 and increase that to approximately 30 in 2013. The project will become self-sufficient after 2013. Operated through a non-profit-making Community Interest Company, all income will be invested back into scheme. It will seek to boost the Welsh economy by supporting existing beekeepers and attracting new people to beekeeping, including farmers and landowners.